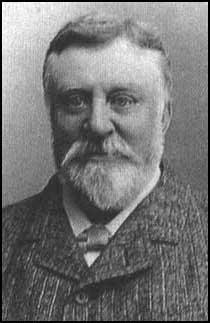 Arthur Liberty, the son of a draper, was born in Chesham in 1843. After a brief schooling he was apprenticed as a draper's in Baker Street, London. After completing his training he moved to Farmer & Rogers' Great Shawl & Cloak Emporium in Regent Street. In 1862 Liberty was appointed manager and ten years later was offered the opportunity of becoming a partner in the business. After considering the offer Liberty decided to start his own business. His wife's grandfather lent Arthur Liberty £1,500 and he was able to open a shop called East India House at 21a Regent Street. Liberty initially concentrated on selling products made from Japan, but later imported goods from China, Java and Persia. Liberty also began producing his own range of silks. Another popular product was Umritza Cashmere, a material that combined lightness and softness with durability. Liberty gradually expanded his business and by the 1880s his shop had seven departments: Silks, Embroideries, Furniture, Carpets, Porcelain, Curios and Miscellaneous Items. In another shop in Regent Street, Arthur Liberty sold Japanese and Chinese antiques. There was a great demand for the goods that Liberty was selling and in 1887 he opened another store in Birmingham. Later he opened a Liberty Store in Paris. He also accepted commissions for decorating the homes of the wealthy. When Arthur Liberty died in 1917 he left over £350,000.